The Hulk is the latest super hero to grace the silver screen in this current surge of comic book movies. Directed by acclaimed director Ang Lee, the Hulk revolves around the story of a brilliant scientist called Bruce Banner (Eric Bana) who unwillingly unleashes an inner anger within by receiving copious amounts of gamma radiation from a scientific accident. Although the accident would of killed a normal man, Bruce Banner soon realises that something in his genetic makeup must of saved his life. Plagued by strange visions and blackouts in the Hospital, Bruce Banner is visited by a stranger that claims to be his father (Nick Nolte) who unleashes his sons fury through years of repressed memories. Unable to control his anger, Bruce Banner transforms into the green super-powered Hulk who goes on a rage-fuelled rampage of destruction and mayhem. When the Hulk's anger subdues, he transform back into Bruce Banner with only vague memories of what just occurred. Ex-girlfriend and colleague Betty Ross (Jennifer Connelly) soon realises that her former lover is suffering from the effects of the gamma radiation and when her estranged military father turns up, General Ross (Sam Elliot), the stakes are raised and the sins of the fathers are finally brought into the light. Those that grew up with the original live action television series, the 1960's cartoon series or even the comic book will immediately realise that this is a very difficult Hulk story. Directory Ang Lee does a wonderful job at recreating a comic book like atmosphere with some amazing cinematography that is reminiscent of a comic book with bright colours and extremely sharp pictures. Apart from the unusual origin of the Hulk and Ang Lee's strange story telling techniques, the movie is indeed a modern masterpiece with an amazing array of actors, some of the most realistic CGI to have ever graced a movie before and of course the dramatic super-hero ending that can only be considered a true epic. The movie even features the Hulk's creator Stan Lee and Lou Ferrengo, the body builder who played the Hulk in the late 1970's television series as cameos in this modern version. The video quality of the Hulk will probably become a benchmark DVD because of the vibrant colours and extremely sharp picture quality with no errors whatsoever. With such a professional DVD transfer, the sound is also magnificent and you can really appreciate the attention to detail when Bruce Banner transforms into the Hulk. There were some moments in the picture that I had to turn down the sound in fear of disturbing my neighbours from the realistic sound quality. With DD 5.1 surround, 5.1 DTS and Dolby Surround, there is a sound format for everyone on this DVD collection. 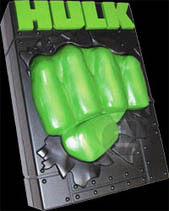 The Hulk Collector's Edition contains three discs of pure DVD enjoyment with some of the biggest "hulk" special features in existence. Not only are the special features entertaining and informative but they really give you a unique perspective of not only the comic book character the Hulk but also the process of how they created the movie itself. This DVD collection is a must have for any fan of comic book movies or for those that love a well thought-out movie that must be watched over and over again. With hours of extra content, amazing video and sound quality, this is one DVD that I am extremely glad to own.